The original Michelangelo took painting to new heights by turning the bible into a masterpiece. 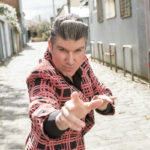 Mikelangelo Sings Cave – Waits – Cohen sees a brave performer take on the canon of three, immortal songwriters and sculpts them into his own works. These songs would have dwarfed a lesser performer, leaving audience members able to yawn that they’ve been here before. they knew this room, they’ve walked this floor, but Mikelangelo makes a little history, baby, every time each song comes around. As a fan of Leonard Cohen, Tom Waits and Nick Cave and as someone who had never been in the presence of Mikelangelo before, I was apprehensive about seeing this show, expecting the singer to be a counterfeit who tried to gyp* us out. After all, how could anybody tackle songs by these masters without them ending up like reheated leftovers after a great feast at best, or slightly better-than-average karaoke at worst? Well, for starters, Mikelangelo destroyed my fears in the opening bars of his first song as he made it clear that he was not there to replicate great songs, he was there to perform great songs in a way that worked to his strengths. This meant he let his deep, powerful voice do what it does best; sometimes bellowing from the depths and at other times backing right off. He even affected a little southern US twang at times, honouring Nick Cave’s penchant for this style, and Leonard’s little-known roots in country music. This is a show for anybody who wants to journey to the heart of songwriting. Mikelangelo’s arrangements betray his great empathy for the spirit of each song he chose put in the spotlight. Often the instruments take a moment to sleep on the road while Mikelangelo’s voice steers for us, highlighting the beautiful wordplay of these masters in the high beam glare of this maestro from Canberra. But then adept playing of his guitar, piano and accordion (named Rita, bought a few years earlier while in Adelaide) edge back into the driver’s seat to guide us from terrain to terrain. He employs all of his body to lend percussion along the journey, with his flamenco-like foot stomps sprinkled throughout the show like diamonds on our windshield. Of particular note are his interpretations of Hallelujah, Red Right Hand, and Dance Me To The End Of Love. In these songs, he challenged my lack of belief in an interventionist god; they are almighty renditions. Mikelangelo has an intriguing stage presence. At once, there is the absorbed, earnest, Cohenesque singer, standing before his audience with a grand sense of occasion and sincerity but there is also the cheeky, comfortable troubadour ready to use his wit to disarm and woo the audience to earn roses by curtain fall. 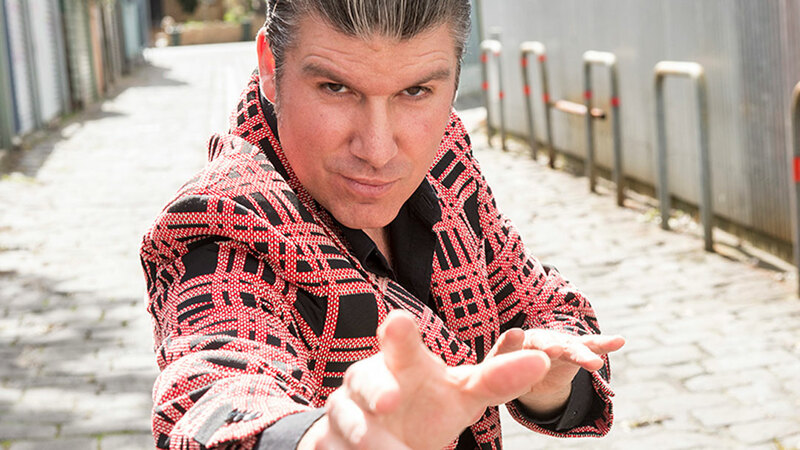 In the small, intimate La Boheme, Mikelangelo is at home and you would do yourself an injustice were you not to grab the last few tickets available for his few remaining shows. Please sing another song, Mikelangelo, without you we’ll grow old and bitter. *The term “gyp” was used by Tom Waits in Saving All My Love For You. This article explains how the term is considered a racist slur against the Roma, aka Gypsies.